Red-hot favourite Tiger Woods is OUT of this year's Open. Tiger failed to survive the cut after a 2nd round score of 75 left him +5 for the championship - one shot too many. 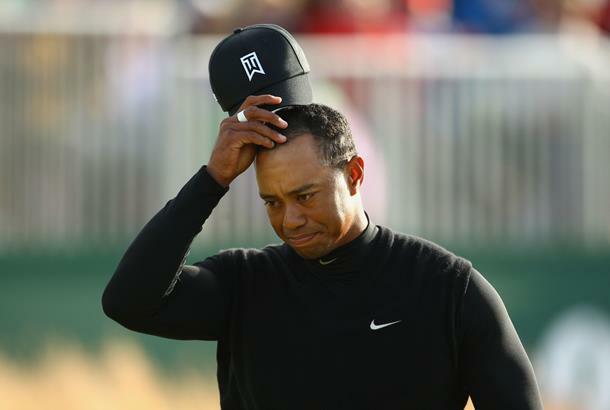 It's the first time Tiger hasn't featured over the weekend at the Open and only the third time he has missed the cut in a major - the 1996 Masters and the 2006 US Open (after his father died) were the others. Tiger may not be around for the weekend but veteran Tom Watson certainly will. In fact the 59-year-old 1977 Open champ at Turnberry will go into tomorrow's 3rd round as joint leader on -5 with surprise package Steve Marino (USA). After a tricky start, Watson kept plugging away and sensationally holed a 60ft putt for birdie on the last green to hit the front... much to the crowd's joy. But this year's Open is wide open. There are so many players in contention and many will fancy their chances, particularly now Tiger is on the way home! Among them are Ross Fisher (-3) and Lee Westwood (-2), comfortably the pick of the Brits. Also ominously lurking just behind the frontrunners are experienced campaigners Vijay Singh and Retief Goosen (both -3) and Jim Furyk (-1), all proven performers and major winners. Padraig Harrington, chasing a hat-trick of titles, is also hanging in there at +3 by the skin of his teeth but he'll have to do something specail over the weekend to make ity three in a row. "Eight shots behind isn't great. Hopefully I can improve on that over the weekend and make a run," he said. Besides Tiger, other big names to miss the cut include Anthony Kim, Adam Scott, former US Open champ Geoff Ogilvy and Ian Poulter (+14) who had a calamitous Open. But 16-year-old Italian Matteo Manassero will be in action, clinching the amateur's Silver Medal after excellent rounds of 71 and 70 (+1).